“Both sides have to be able to claim that they got something out of the deal, and I think that’s what you’re seeing now,” said Theresa Cardinal Brown, director of immigration policy for the Bipartisan Policy Center. The agreement will also need buy-in from President Donald Trump — who did not appear convinced of the compromise early Tuesday. One point of disagreement between Republicans and Democrats is whether the border security funding covers a “wall” — Trump’s signature campaign promise. The deal provides $1.4 billion that will fund approximately 55 new miles of border barriers. The amount remains far below Trump’s $5.7 billion demand in wall funds, which led to a 35-day partial government shutdown in December and January. Under the agreement, the barriers must adhere to currently deployed designs, including the “steel slats” that Trump has said could be acceptable for security. However, the proposal excludes the possibility of building wall based on any of the eight prototypes commissioned by Trump and built in the San Diego area. Whether lawmakers describe the current barriers on the border as “wall“ or “fencing” often falls along party lines — and that trend continued Tuesday. A Republican summary of the deal said it allocates the money “for the border wall.” But Sen. Dianne Feinstein (D-Calif.) said in a written statement that the proposal would pay for “fencing in Texas“ that equaled the funding boost provided last year. 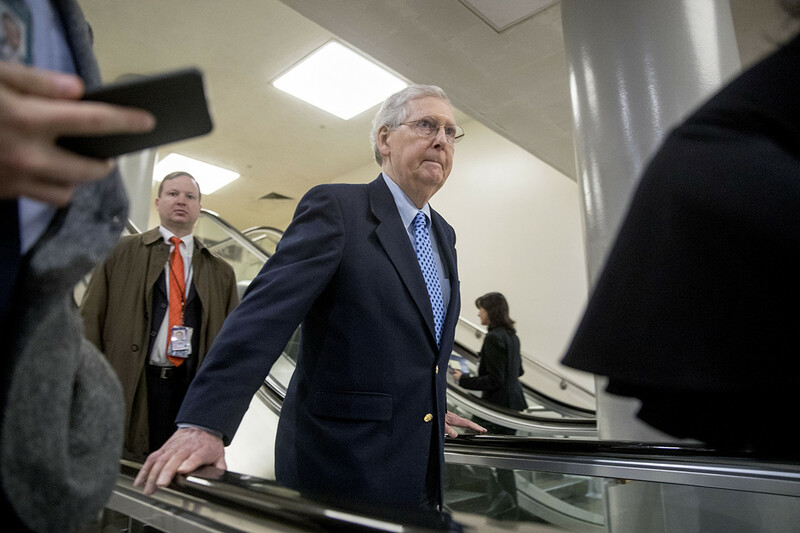 Senate Majority Leader Mitch McConnell took a third path and said the funds would pay for “new border barriers“ when touting the agreement on the Senate floor Tuesday. The barrier funding would be similar to the amount approved by Congress last year. A spending bill passed in March provided $1.4 billion to build an estimated 84 miles of new and replacement barriers along the southwest border. Thirty-three of the miles provided in that bill were devoted to new miles of barriers using existing designs. The entirety of the new mileage under the latest proposal will be in Border Patrol’s Rio Grande Valley sector in South Texas, according to summaries of the deal. One congressional office involved in the talks said the agreement includes “major restrictions to protect community and environmental interests,” but the details remained unclear Tuesday. Detention spending also emerged in recent days as a point of contention. Democrats sought to cap detention funding to Immigration and Customs Enforcement, as the agency continues to detain more immigrants under Trump. A spending bill passed in fiscal year 2018 provided funding for a yearly average of 40,520 beds. ICE exceeded that number significantly in the past year: the agency held 48,502 people as of Feb. 2 and its “average daily population” (the yearly average) stood at 45,814 detainees. The deal reached Monday would fund a yearly average of 45,274 detention beds, according to two offices involved in the talks. That’s a 12 percent increase over the levels funded in last year’s spending bill — even as Democrats have disputed that number. Feinstein said Tuesday that the deal would keep detention bed funding flat at 40,520 beds — a figure at odds with reports from congressional staffers with knowledge of the talks. A Democratic congressional aide told POLITICO that Democrats assume that ICE detention levels will fall throughout the year “because they are so high now” and will finish at closer to 40,000 by the year’s end. But that hasn’t been the trend in recent years, and the Trump administration has given no indication it will stop trying to detain more migrants. Beyond that, the agreement will not cap ICE detention levels, which means the Homeland Security Department will have the option to transfer and reprogram funds to increase detention funding later in the year. A summary of the deal from a Republican congressional office estimated that ICE could potentially detain 58,500 people with the funding flexibility provided in the agreement. The 45,274 beds in the bipartisan deal would be sufficient for the Trump administration, according to a DHS official, because ICE could potentially shift funding from other areas later in the year. “As long as there’s not a cap, we’re good,” the official told POLITICO. In addition, the agreement provides funding for “alternatives to detention,” such as ankle bracelets and case management programs for detainees, the staffer said. Is North Korea’s timeline to denuclearise for real?